Lucid Technologies is the brainchild of a group of IT professionals with a vision on emerging requirements for today's IT Market. Coming from diverse professional backgrounds, we have felt the need for a different approach to Software development, consulting and training within the industry. This has motivated us to formulate a unique approach to help organizations to become a more effective & competent with the technologies. Lucid Technologies, Inc has been providing faster, smarter, better information technology solutions and consulting services around the world for a variety of industries including energy, healthcare, financial, pharmaceutical, telecommunications and government services. We have been delivering high quality, reliable and cost-effective IT services to customers globally. We provide world-class technology services by constantly exploring and implementing innovative solutions that drive long-term value to our customers. We have demonstrated a high degree of flexibility, scalability and service orientation to enable us meet the strategic goals for some of our clients. 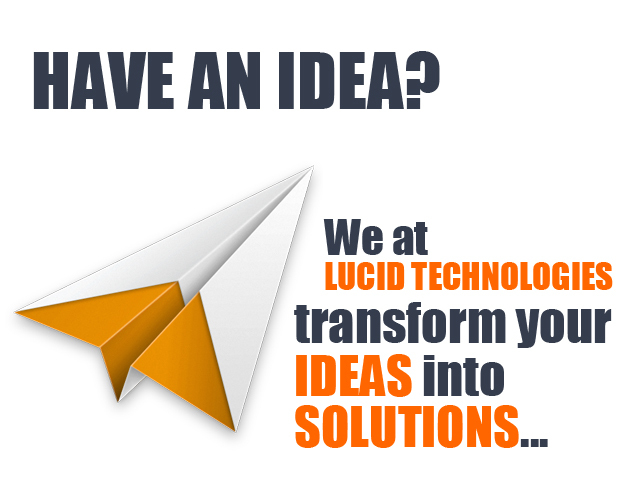 Lucid Technologies, Inc is a leading IT and business process services provider that has a combination of the deep knowledge of technology and business process and leveraging its vast experience in providing information technology solutions. We deliver end-to-end solutions through valuable strategy development, consulting services, and unique delivery capabilities. Extensive experience in Strategic HRM, Strategic Management, International Management, Managing Multiple Projects, Software Analysis, software Development / Work Plans, WBS, Budget / Financial Analysis. Expertise in leading multiple offshore/onshore projects, Vendor Management. Specialties: IT Management - Strategist or Architect, IT Management, Business Analysis, Project Management. Experience encompassing in the IT Staff Augmentation and Consulting space,new business development and managing large client accounts. Handles various duties including: Service, Sales, Oversight, Execution, Team Building, Upbringing Employee Motivation, Team Management, Client Management, Strong Ethical Quotient, Off shore, Off Site/Onsite expertise and managing several recruiters. Extensive experience in Software & Web development from concept through implementation with Ruby on Rails framework, Experience in developing scalabe applications, systems engineering, algorithms and software/architectural design patterns with main emphasis on OO and MVC, Data modeling, User Interface design. More than a decade experience in the IT Industry and as Director of Consulting Services. He has been playing a key role in strategic planning, establishing alliances & partnerships and focusing on business development. He has been instrumental in growing the sales team, getting new client accounts and in talent acquisition. Specialties: Client Relationship, Management Skills, Recruitment, Interviewing, Performance Management, Employee Relations, Training & Coordination, Induction Programs, Immigration, Project Management.